Now that the majority of the hustle and bustle of the holiday season is behind us, we are proud to announce the date of the next wine exchange. Being the next one is in the month of February, we’ve decided we are going to be traditional and make a “With Love” theme. 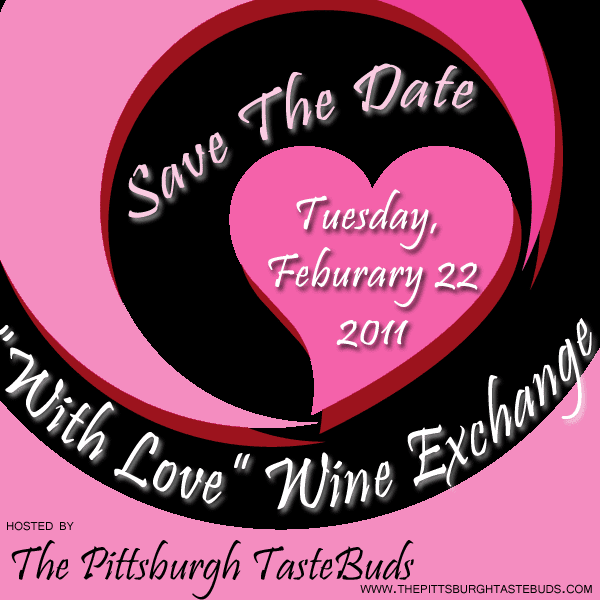 The next wine exchange will be February 22, 2011. Please mark your calendars and everyone is strongly encouraged to RSVP on Facebook by February, 8. And don’t forget to vote in our online poll where you can choose the cuisine for the event. The poll is only available at ThePittsburghTasteBuds.com. Don’t want to regift the wines you received for the holidays? Visit MyWinesDirect.com to order wine online and have it shipped to your doorstep – even in Pennsylvania!